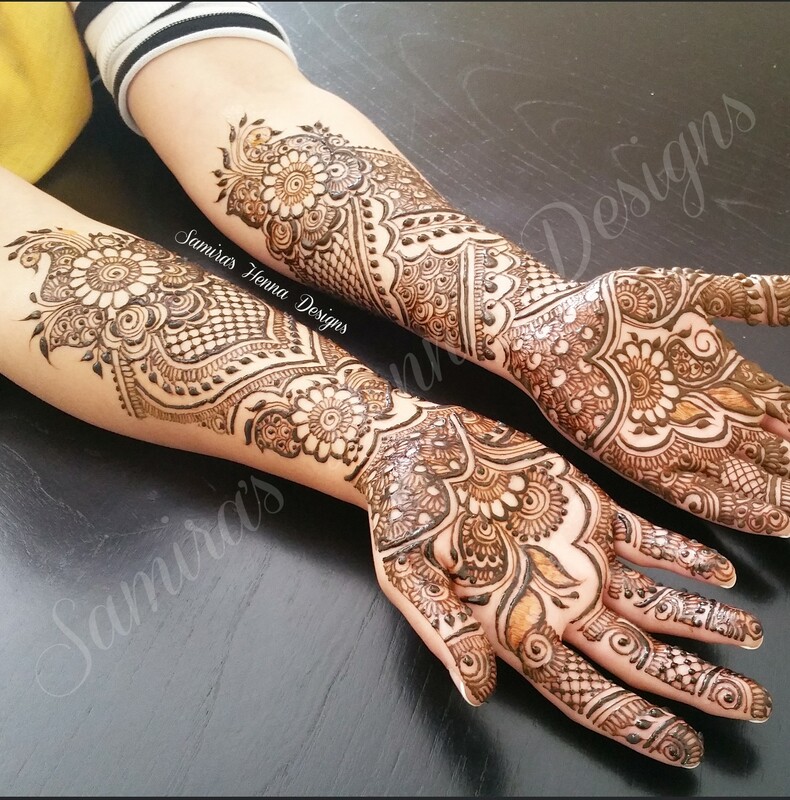 Let’s take a look at Texas based mehndi artist Samira’s outstanding designs! Samira grew up in a multicultural family. She took up professional mehndi three years ago. And ever since then, Samira hasn’t looked back. Henna artistry is her passion. In her words- “I guess all the years of doodling in class paid off”. She completed a degree in nursing in 2010 and worked in the health care sector for a few years. 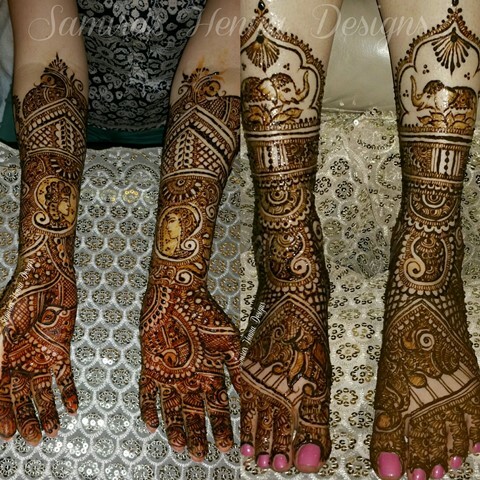 But Samira’s fire burned greater for doing what she loves to do, which is mehndi designing. She is known for doing diverse designs on the brides, be it contemporary, or featuring strong influences from Arabic, Moroccan, Indian, and Indo-Arabic fusions. 1. Tell us about yourself – when did you begin doing this and how did u think of getting into this line? I picked up my first henna cone 3 years ago. We had an eighty person party and the main entertainment was providing henna for the guests. Two days before the party the henna artist cancelled. Since I am the most artistically inclined person in my family, hence, my relatives vouched for me to buy a couple of cones and figure out how to do simple flower and paisley designs. I practiced 5 to 8 hours a day those 2 days. When it came to the party, the guests were really pleased with my work and every weekend after that, someone knew someone who wanted me to provide henna for their party. 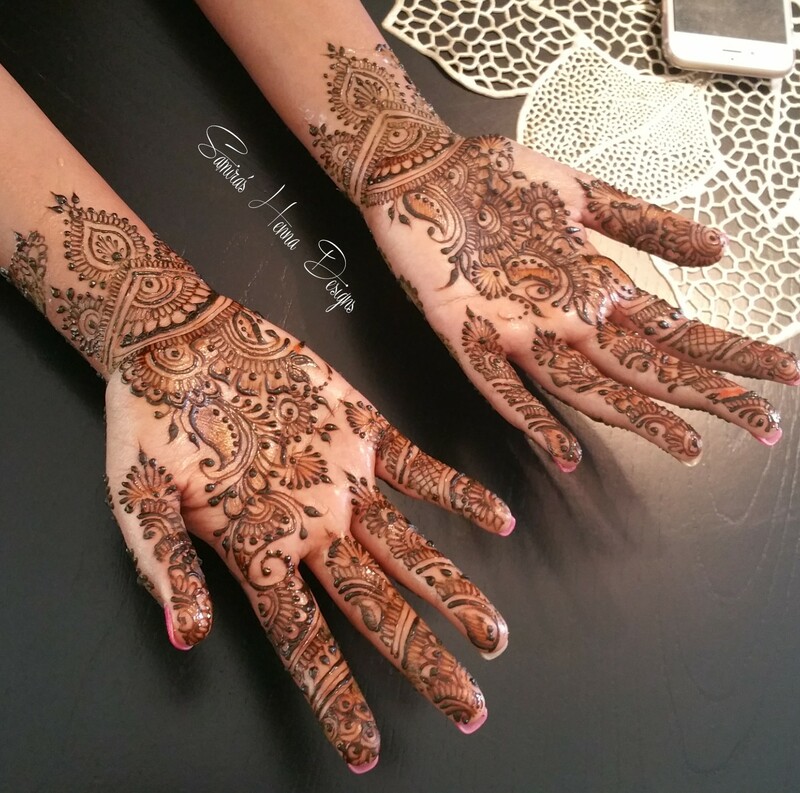 Right now my absolute favorite is a Indo-slight Arabic Fusion done on a recent bride. It is full of bold motifs with tiny thin lined detail complementing it all around. Another design that I love a lot is a non tradition one. Its contemporary and almost looks like a piece of jewellery. It also has a tribal feel to it because of strong geometric representation. Another design that will stay special to me forever is the finalist photo that made an entry in the “Maharani Weddings E-Magazine Mehndi Contest 2015”. I grabbed 1st place for the same. I did a lot of research to see which pictures were more photogenic and trendy at the same time. It happened to be those pieces that not just had clean detailing but also incorporated beautiful negative space at the same time. I got inspired by Bharati Sanghani’s work to learn how to incorporate amazing detailing with very prominent and eye pleasing negative spaces. 3. 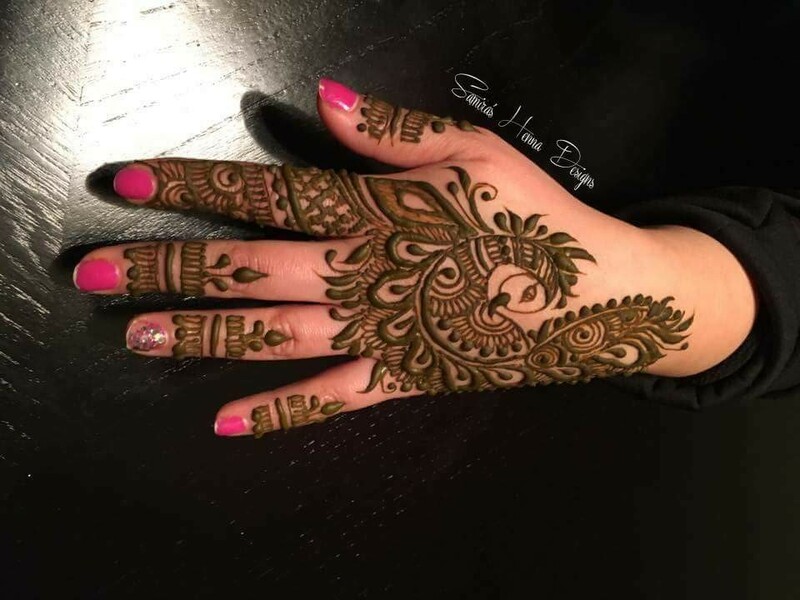 Most memorable experience you had while doing mehndi designs? 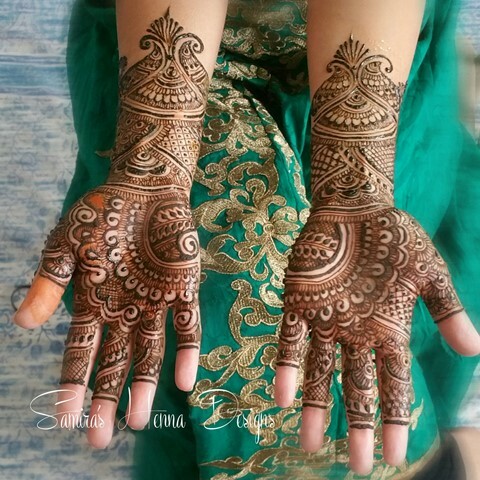 My most memorable moment was when I was still very much a newbie and I never was able to grasp or develop true Indian mehndi designing style/application/skill. A bride told me she wanted more Arabic inspired bridal mehndi design with a little Indian touch to it. I was confident that I could create something she would like and I made 3 sketches that incorporated the style as described by her. Once I got there and started to work on her bridal mehndi, and showed her the sketches, she said that wasn’t interesting enough. She browsed though her Pinterest and showed me traditional and very delicate Indian designs, which was the exact style I could not master after previous failed attempts. I had 2 options- either call someone who did know or pray to god to help while I gave it my all. I did not want to back down from my fear, so I gave it a go. Result- I created beautiful traditional Indian art that the bride and her family loved a lot. I was surprised as well because the design looked really good. That night I learned a lesson, that my fears were not stronger than my passion, and with passion – your dreams are no longer a figment of your imagination but instead a reality waiting for you to own it. When natural mehndi paste is applied on the skin then you will have to wait for it to dry completely. When the paste dries-off, I apply a lemon/sugar glaze on top of the design, which works as an adhesive as well as helps with the color/stain. I tell my clients to leave on the paste for at least 4 hours. Then they can scrub it off with vegetable or coconut oil (I usually use the cupped end of the spoon to help with the actual scraping off of the paste). Avoid water contact on the designed area for a minimum of 12 hours. Even after those 12 crucial hours, don’t use water or soap generously on the applied area. Before showering, I usually coat the design with vegetable or coconut oil to help repel the water on the designed area. The best way to reach me is through my website. I am also very active on Instagram and Facebook.